Have you ever given your name even a moment’s thought? I was reminded of this recently when I read about Mo Farrah deciding to become Mohammed Farrah. Now that his track career is ended, he wants to make a clean break, to leave the pressures, glory and stories behind and reinvent himself. I’ve had an opportunity to do this more than once and each time something truly remarkable has happened. I was born Nicola Jane Attwood. Except of course, I wasn’t. My Mum gave me my name. Nicola Jane – a really common combination in the 70’s. Who knows why. I like to think it was our version of Britney. Nicola – is a Latinised version of the Greek personal name Nikolaos (Νικόλαος), derived from Nikos meaning “victory”, and also meaning “people”, therefore implying the meaning “winner of the people”. For me it was just who I was. A baby girl growing up in a house with a Mummy who cried a lot, a sense that life was hard and a growing understanding that staying quiet and being nice kept everyone happy. Oh and you better call me NicOLA – because that was my name (my Mum told me so). The more significant learning came when I was 6-years old, when I understood what my surname meant – Attwood. It became super clear one day at school – it meant different, isolated. It meant “you’re not like the rest of us”. “you don’t have the same name as your Mummy and Daddy”. I can still hear the taunts now – maybe they were just curious; it didn’t feel like that though. It felt embarrassing, like I’d done something wrong, like I didn’t belong. And that feeling became a familiar one. As an only child (another name we like to give out), I felt like I was alone. I knew I was loved and yet the sense of only me in a big world felt even more truthful. I didn’t have a sibling to share things with, to play with, to even share a name. There was just me. Growing up, looking for “my people”, friends who I could spend hours, weekends with. Creating my own sense of family, somewhere I could be accepted as me. I never shared with my parents how much not having the same name meant to me – it was never talked about. Even when I was bullied at school. I stayed true to my name, within my persona – quiet, nice, trying to get it right. And to be loved. In my 20’s I became a Nic. I felt like I’d out grown prim and proper Nicola and wanted to loosen up a bit, so Nic emerged. It felt edgy, fun, grown up. Good grief, THAT was my idea of loosening up? It wasn’t until I got married that another lightbulb hit me. I became Nic Conway and in that one moment, I became someone. I cringe to write this now and yet it was, at the time, my truth. I even had “you complete me” engraved in my wedding ring. Good grief. It is what I believed. That in marrying someone I was finally accepted. I saw so clearly how the name Nic(ola) Jane Attwood had represented shame. That vicariously I had absorbed all those feelings and emotions and owned them as mine. I had woven them into my personality, like unspoken laws, and shaped my world accordingly. Nicola Jane Attwood was a people pleaser. She was needy. She was willing to go to extraordinary lengths to fit in. She wanted to be looked after and could be easily manipulated in her desire to be loved. She played it safe, cautious, yet over trusting to those who showed her affection. In marrying it felt like I could finally let them go. I was no longer that girl. They were no longer my stories. A bride. A woman who had been chosen, who had waited until she “knew” this was the right one, a career girl, starting a new life in a new country, with a new husband. It felt liberating, empowering, exciting. Like a new person was being birthed. And in so many ways she was. Just even saying the name Nic Conway brought a smile. It wasn’t a bride thing. It was a new identity. And so, it was for many years. Nic Conway achieved things that Nicola Jane Attwood could only ever have dreamed of. Scaling the career ladder, earning eye watering salaries, being head hunted by companies, winning awards. Traveling the world for pleasure and business. Lavishing myself with luxury products and gifts because “I was worth it”. Overly generous with friends and family to cover up a growing hole of uncomfortable knowing. 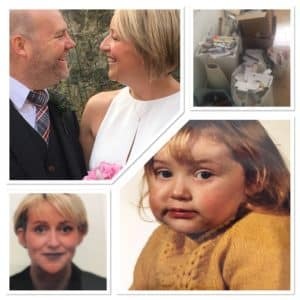 When my marriage tumbled, when the irony of “you complete me” revealed itself as a thin veneer of 90”s cheesy Tom Cruise rhetoric, when the unknown gambling debts threatened to swallow me whole; Nic Conway hid. The “old agreements” and beliefs came out to play like ghosts and ghouls, mocking my naivety, taunting me endlessly, driving me to spend hours, days of my life sobbing on a sofa whilst presenting myself to the world as “fine”. Living my life in the shadows. Reliving the shame. The guilt, the familiar depression following the bloodlines of the family tree. And slowly, tentatively a different Nic Conway stepped out. Nic Conway; the perfectionist, the controller, the giver. The one who loved life – especially when it was going the way she wanted it to. One with a big heart with a lot of love to share – the one who loved to serve, to help others realise it didn’t need to be so hard. One who simply wanted to be happy. And now a new line has been drawn. On the 24th August 2017, Nic Devlin was created. In truth, it has felt like she has emerged. Like a caterpillar becoming a butterfly. Each stage messy, painful and essential. Part of a master plan, one that couldn’t be rushed or aided. A process of evolvement, so profound that going back simply couldn’t be possible. Key events happening exactly as they needed to for the next to perfectly unfold. Not in a new bride way – in a mind blowing, “how did I not see that before?” lightbulb way. We carry our names round like a persona. 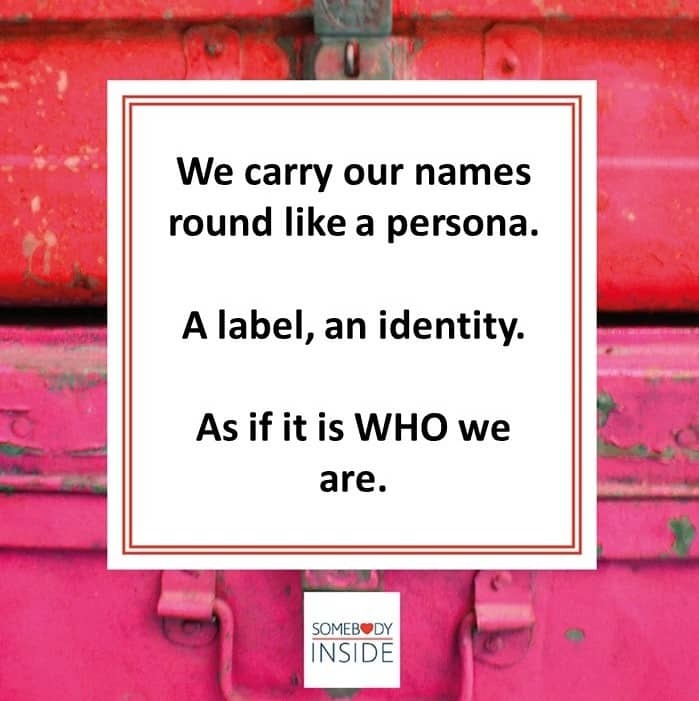 A label, an identity. As if it is who we are. Like picking up a tin of beans and looking at the ingredients seeing them all as our predefined characteristics, flaws, DNA. Seeing ourselves as characters in a movie that has a predefined ending. With no control or choice. And we are WAY MORE THAN THAT! We can decide exactly who we want to be at any time. ANY TIME. We get up in a morning and we get to choose if we are still the person who is grumpy before 10am. Like all the other mornings before. We get to choose whether to source all our happiness on the outside and hope that it shows up exactly how we want it to. Or we can decide to love ourselves on the inside and see how that inner contented glow lights up the world. Just for fun. You get to choose it all. You are not pre-defined by a name. No permissions needed, no one to ask – you just decide – who do you want to be, and then BE IT. Of course, you don’t need a name change – it’s just that it’s a public declaration that something is changing. I can say “oh yes Nic Conway used to wear that’ – Nic Devlin doesn’t. (Another 38 items to the charity shop and regular readers will know I’m not exactly a hoarder! Nic Conway used to love systems and processes, often over engineering them. Nic Devlin keeps it simple and easy, creating space for living. Nic Conway did some great work once and needs to hold onto the paperwork forever, just in case. Nic Devlin doesn’t do that type of work (see pictures – 8 boxes worth went out. In a day!). Nic Conway used to drink milk even though it made her poorly. Nic Devlin doesn’t drink milk. Nic Conway liked to control, Nic Devlin shows up for life as its presented. Nic Conway liked perfection which sometimes paralysed her. Nic Devlin knows her best changes daily and that just starting creates magic. Nic Conway loved to give and give. Nic Devlin recognises boundaries are important for herself and for others. Nic Conway loved a to do list so much she created to do lists for her to do’s. Nic Devlin loves LIFE more than she loves lists. Nic Conway was perfect in every way, she just couldn’t always see it that way. Nic Devlin accepts herself fully. Right now. Nic Conway would still worry sometimes about what others think. Nic Devlin is committed to showing up vulnerable, whole and real. Nic Conway would have fun when her jobs were done. Nic Devlin chooses joy, fun and laughter first. Every time. Nic Conway had stories from her past that she sometimes found hard to share. Nic Devlin knows everything happens for a reason. She opens up in service of others. Nic Conway just wanted to be loved. Nic Devlin knows she is love. Of course, some shifts are easier done than others. When you decide you’re not going to do or wear something any more, it’s like a switch is turned and it becomes someone else’s. Gone. Every part of your life is simply just a series of choices. Choices that you can change every day. So, if you could reinvent your story, make a different choice, drop your cloak of stories, who would you choose to be? And then align every thought, feel and action to BEING THAT. Honestly you’re guaranteed the life you truly wish for. When YOU CHOOSE. Hi, I’m Nic Devlin, pleased to meet you. What’s Your Name? PS Remember we talked about The Women’s Thing a few months ago? Brilliant piece. Thought provoking and so honest. Wow Nic Devlin. You bring out the smiling tears.